Forget about Tea Parties, GOP Congresses, and biased Supreme Court Judges. No matter how bad things get, they still can't stop us from dreaming. 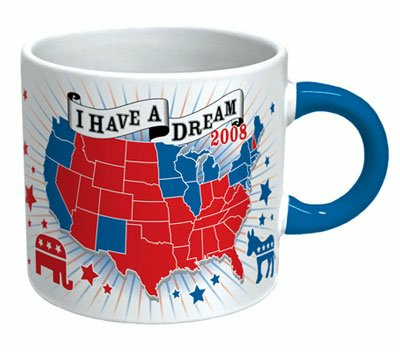 And that's what the Democratic Dream Mug is all about. This large ceramic mug depicts the United States divided into red states (GOP leaning) and blue states (Democrat leaning). But when you pour hot liquid in, something miraculous occurs - All of the red states turn blue! Imagine the satisfaction you'll feel as you watch Texas, Arizona, Montana and all those others turn blue and join the good guys. We're not promising anything, but if enough of you buy this mug, it might just come true! NOTE! Disappearing mugs are not dishwasher safe.